Victoria recently graduated from the Academy of Arts, Careers, and Technology (AACT). 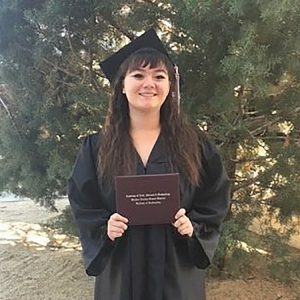 Her high school experience was unique in comparison to her peers; she completed school with CTE endorsed honors and a weighted 4.59 GPA, and underwent 9 months of rigorous treatment for leukemia. Being a student and a cancer patient proved to be difficult for Victoria mainly because she missed out on social aspects of high school during her sophomore year. She was not able to enjoy learning in a classroom while in treatment and had to adapt to learning in an isolated setting away from her teachers and friends. At her graduation, Victoria delivered an inspiring speech where she shared her gratitude to the support system that helped her through schooling during treatment. “For the families sitting out there that aren’t aware of this, I was diagnosed with cancer in 2015 and underwent experimental chemo. You need to know that the students and staff sitting up here are the reason that I survived my sophomore year. I never felt alone because the people here today supported me and loved me unconditionally,” said Victoria. Victoria was an assiduous high school student who earned numerous awards to validate her years of hard work. She was a four-time Health Occupational Students of America (HOSA) state medalist in Pathophysiology, a HOSA International Hall of Fame inductee, a HOSA state Outstanding Student Leader 2016, and she received the Renown Courage Award. These prestigious awards will undoubtedly help her on her path to becoming a Pediatric Hematologist/Oncologist. Victoria was inspired to help children because of her own experience with cancer and enjoys sharing her story with others. The Leukemia and Lymphoma Society invited her to speak in front of 10,000 students about her experience with leukemia. “Being able to share my experience with so many people felt absolutely incredible,” she said. College is right around the corner for Victoria. 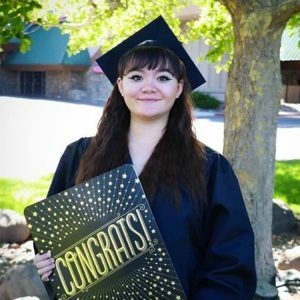 She will be majoring in biology at the University of Nevada, Reno, and is excited to take more steps towards her dream job in helping children with cancer. She was awarded the Inspire Scholarship from the Northern Nevada Children’s Cancer Foundation to help her pursue her dreams in medical care. “To the graduating classes before us: thank you for blazing the trail. To the graduating classes after us: thank you for keeping our legacy alive. And to the graduating class of 2018: I am so proud to be a part of this group. Class of 2018, it’s time to say goodbye and, more importantly, thank you for making me the person I am today,” said Victoria.